Community members have been souring on plans for a visitors center in Jackson Park. SOUTH SHORE — A proposed visitors center for Jackson Park got pushback at a Tuesday night community meeting, prompting Chicago Park District officials to say they would back away from the proposal if the community doesn't want it. “I’m not in the business of building anything people aren’t in support of, and if there is a loud voice against it, we’ll move on,” said Michael Kelly, general superintendent and CEO of the Park District. 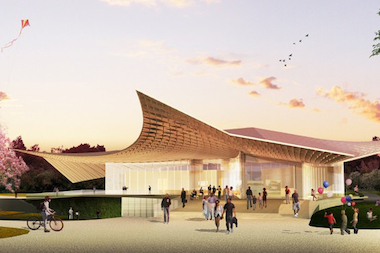 The new visitors center is planned for an area that is currently a parking lot south of the Museum of Science and Industry. The crowd Tuesday was mostly against building the 15,000-square-foot pavilion proposed for the former music court area adjoining the parking lots behind the Museum of Science and Industry. But 5th Ward Ald. Leslie Hairston pointed out that the most of the community has been in favor of the proposal, which hasn’t changed since several meetings were held early in 2015. “Now that there’s more attention drawn to it, we have to flesh it all out,” Hairston said. 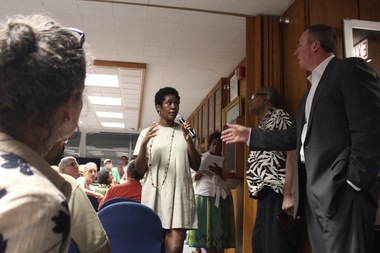 Many at the meeting expressed concerns that outsiders were taking over planning for the park as Project 120 continues paying for many of the major projects in the park, including planting 120 cherry trees; a large work of art being designed by Yoko Ono; and picking up much of the Park District’s cost for a federal-led habitat restoration and the consultants guiding the work. Bob Karr, president of Project 120, said many of the nonprofit's donors come from Hyde Park, and the group is not made up of outsiders. “I’m happy to do whatever we’re asked to do,” Karr said. The audience seemed nervous that the Park District was too keen on what Project 120 was interested in while overlooking ongoing maintenance issues in the park. Kelly ended rumors that the Park District is considering a plan for a new road through the park, saying the bridge that would have been required was being rebuilt only for pedestrians, bikes and emergency vehicles. Hairston and Kelly agreed at the end of the meeting to flesh out the timeline for the project and schedule another public meeting.